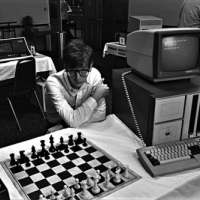 At 9:30 PM, we speak with Andrew Bujalski, one of the most acclaimed directors of the last decade, as he discusses his latest film, Computer Chess, a story about the race for artificial intelligence and the idiosyncratic scientists who devoted their lives to winning it. Bujalski shares his thoughts on technology, counterculture, art, and the state of the film industry. Hosted by Jackson Arn.